This is an all cotton face cloth. The pattern is in Weekend Knitting, and I liked it a lot. It knit up in about a day . . . give or take. It's the first time I've knit with cotton, and it was much different, but just as fun. 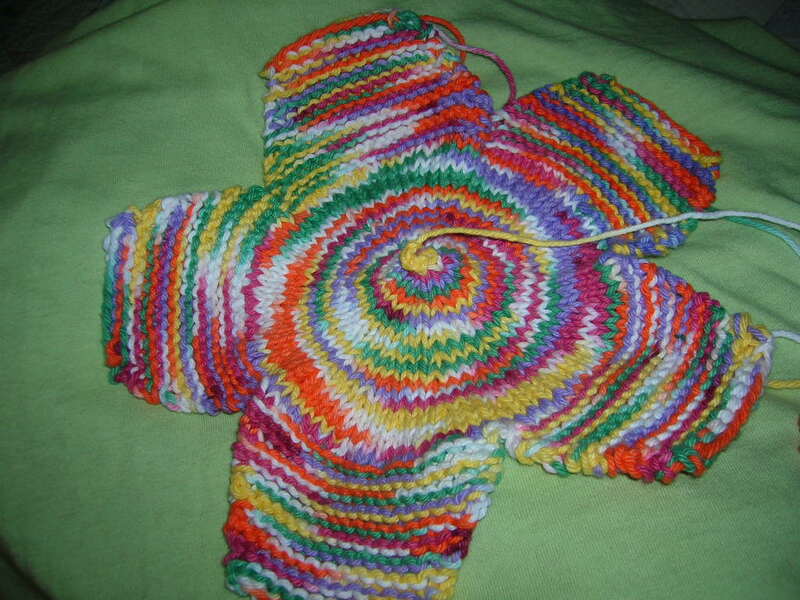 I knit each petal onto a dpn, then when I had knit the 5th petal, I just joined them all in the round, knit a bit, and then started the drastic decreases. 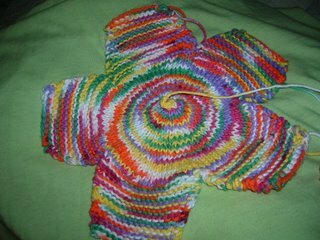 I have to admit that I lost track of what I was doing near the end and did one more row than I should have! LOL I love the way this turned out! I'll be making more! It makes giving a washcloth a respectable gift experience, don't you think? I mean - this, along with a little bar of some kind of homemade soap or something - lovely gift, right? One of my friends at work has lost his favorite hat. These next two are my attempts to find a pattern that he'll like. 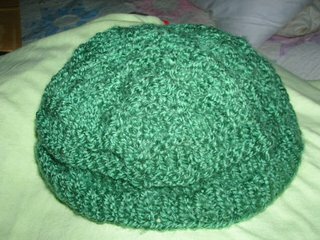 I had this bulky yarn, which I love to use, and thought I'd just make up a few hats until I get it right, then I'll copy the good one in black, which is what he wants. This is Bernat Softee Chunky yarn - love it! I'll get the same yarn in black for him. The first one is from this online pattern and was a joy to knit. I also like the little holes in the pattern (although my pic doesn't show them up well). This hat is one i've created from the second of this online honeycomb pattern. Again, the pic doesn't show it well. 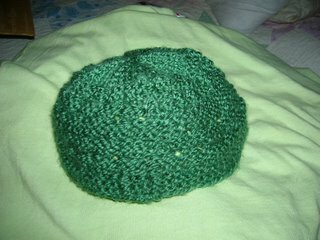 I need to tighten up the cuff and make a few other adjustments to make the hat smaller all around, but I like the pattern a lot, and I'll share it here when I get around to fixing it. I also have a gift started for my sister. I need to finish it by July 22 for her bridal shower . . . and THEN I will post some pics. It's not complicated, but I think it will be elegant and pretty. We'll see. I just hope she likes it. I'm not posting it yet in the off chance she ambles by before July 22.